A CHEF has finished his days working in a high-street kitchen and embarked upon a new road of culinary adventure. Philip Jull was the head chef at Chichester’s North Street restaurant Amelie & Friends. However, he has stepped away from the business now and instead turned his attention to what he described as ‘the street food revolution’. A local man who grew up in Chichester, Mr Jull said he was ‘passionate about food’ and had spent a long career in catering, including running pubs and being executive chef at the Masonic Lodge in central London, as well as his time back in his home city at Amelie & Friends. He has created a roadside cafe called The Pass, which is located between the West Hampnett Roundabout and the McDonalds Drive Through, just off the A27 Eastbound. Roadside cafes do not tend to have a good reputation for food and one of my aims is for The Pass to break that mould. My idea is to make quality fast food, using fresh ingredients and using the same techniques I would use in a professional kitchen and bring it to the roadside,” said Philip. The Pass opened in January 2015 and in May 2017 The Pass 2 was born which can be found at Barnfield Retail Park, opposite Wickes. Phil said already he was building up a good reputation with his speciality of handpressed gourmet burgers. The van is also available for hire to private events and parties. Since this article was written by the Chichester Observer, The Pass Street Food Cafe has now opened the doors of it’s Restaurant, Takeaway and Delivery. Situated in the heart of the City of Chichester the restaurant offers modern and stylish seating, both indoors and out. The menu is available for eating in or out, with delivery serviced by Deliveroo. 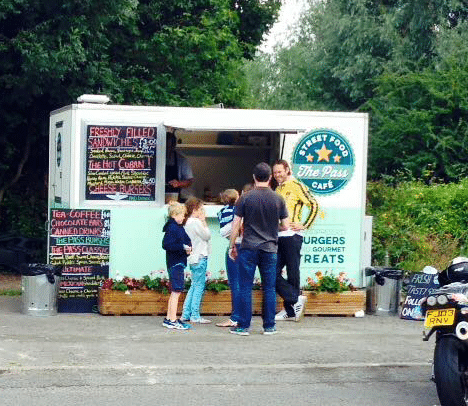 The Pass Street Food Cafe has a great reputation for serving up unique and delicious Handpressed Burgers and Gourmet Treats from its two Pass vans based in Chichester. Hot Cuban sandwiches with slow-cooked pork, Swiss cheese, honey ham, pickles and fresh ciabatta are just some of the delights on offer at the Pass. The Pass prepares awesome and wholesome tasty homemade food to the highest standards using recipes perfecting over time. All suppliers are carefully chosen to ensure only the finest fresh locally sourced ingredients are used. Everything that can be is made from scratch ensuring exceptional results and a wealth of happy returning customers. The Pass is not your usual roadside Cafe or Burger Van. We deliver mouthwaterng, unique & authentic high quality food to the streets of Chichester using professional kitchen techniques. We’ve spent years developing and perfecting our recipes. Check The Pass Reviews on Tripadvisor. 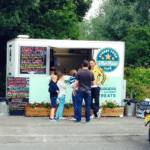 The Pass Street Food Vans can be hired for all kinds of private and public events throughout West Sussex, providing a wide choice of delicious fresh food for any occasion that will delight your guests. Whether it’s a Festival, a local event or a private party, The Pass can provide culinary delights to suit your every need. The Pass Street Food Cafe Trailer and Restaurant are available for Hire. We would love to cater for your up and coming event so give us a little detail by completing our quick and easy Enquiry Form below and we'll get back to you very soon.